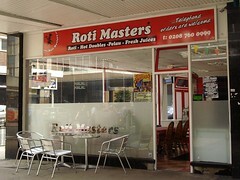 Roti Masters was a Trinidadian cafe and takeaway in Croydon. It closed down in August 2018 photo of notice due to redevelopment of the entire block. Their other branch at St Nicholas Shopping Centre in Sutton remained open. Caribbean cafe and takeaway in Croydon. It is halal. Inside, there's seating for eight at regular-height tables, plus another half a dozen on tall stools, but the space is quite small and would be a bit cramped if all the seats were taken. They also have a small amount of outside seating on St George's Walk (which is covered and pedestrianised). bob visited on a Saturday afternoon in February 2012 and had a very tasty curry goat roti with hot pepper sauce (£5.50). The pepper sauce is optional, and comes in various strengths. There were about five people eating in and a steady stream of people getting takeaways. When Kake visited on a Wednesday lunchtime in May 2016, there was one eat-in customer and a couple of others ahead of me in the fast-moving takeaway queue. No music was playing. Spinach roti (£4.50) was substantial without being heavy, and flavourful despite my choice to omit pepper sauce. The greens used in the filling were more robust than what I'd normally think of as spinach; more like callaloo. The roti itself was dhal puri style, made in two layers with a thin filling of seasoned split peas sealed in between. In February 2018, Kake's takeaway kingfish roti (£6.50) photo was again good; the fish was cooked just right, and lightly pickled carrots and onions provided contrast of both texture and flavour. I was offered the option of having curry shrimp gravy added at no extra cost, and this worked very well; the gravy had a good flavour and the prawn that made its way in too was a good size and had a nice meatiness. The roti was fresh and soft. According to their website as of February 2018, they do delivery (free for orders over £15). Accessibility: No steps to get in. No obvious customer toilet. Last visited by Kake, February 2018. Last edited 2018-10-17 16:23:28 (version 10; diff). List all versions. Page last edited 2018-10-17 16:23:28 (version 10).